As a new sewer, simply starting a project can seem intimidating, but there are a few things you can do that will increase your chances of success. Besides practice (which helps pretty much everyone! ), having a well stocked sewing toolbox is one of the easiest steps to success. Sure, you could start a project and then buy things as you need them, but it is much easier to already have a few basic necessities on hand. The items in this list are the ones I use with almost every project. There are some items that I was on the fence about including because it seemed a little beyond the “basics”, but these are the things that will save time and improve your final project. With Christmas right around the corner, now is the perfect time to let Santa know that you’ve been extra good this year. A sewing toolbox makes the perfect gift for a new sewer. Whether it is for you, a friend, or a relative, share this list and give something that will be enjoyed for years to come. This is where the magic happens. It is important to pick a sewing machine that is basic enough for a beginner, but will still meet the needs of more advanced projects. I use the Brother SQ9050 (and love it! ), but after searching for a link to purchase this exact machine it appears that this model is no longer available. When searching for a similar model, I found the Brother XR9500PRW Limited Edition Project Runway Sewing Machine with 100 Built-in Stitches and Quilting Table. It has a similar layout and features as the SQ9050 with outstanding reviews. Your machine will come with a few sewing machine needles, but after a couple of uses (some people switch it out after every project), it is good practice to change it out. A dull needle can cause all sorts of mayhem such as putting holes in your fabric so keep a few extra on hand and throw away liberally. If I could remember when browsing through the fabric store, I would buy 100 of these – literally. Although you technically only need one for your machine to work, I want to kick myself every time I have to pull the thread off of a perfectly good one to wind a new color on it. At a minimum, keep at least 10 on hand and make sure it is compatible with your machine. I have tried to use a few cheap ones and they don’t wind correctly. If you purchased a new machine, this foot should be included and is used for most basic sewing projects. If you lose it or need a replacement, you can purchase one that is the same brand as your sewing machine or a generic snap-on foot should suffice. If you are planning to make clothing with your new sewing skills, a buttonhole foot is a must. The first time I used one, I thought it was the coolest thing! As with the all-purpose foot, the automatic buttonhole foot should be included with your machine. A ruffler foot might feel like an unnecessary expense, but if you are sewing ruffles or gathers on anything – clothes, dish towels, curtains, etc, this tool will save you an immense amount of time. It is so quick and easy to use, you’ll be wondering why you didn’t invest in one sooner. I like the Distinctive brand listed in the picture because it works on most models. Go ahead and put this on your Christmas list. You won’t regret it! These pins are used when cutting out your pattern and holding your fabric together while sewing. You want to get either standard dressmaker’s pins or glass-headed pins. I prefer the glass-headed pins because the head makes it less likely to get lost in the fabric or sewn on top of which will most likely break your needle. If you choose a pin with a head, make sure you purchase GLASS-headed compared to plastic-headed needles, which could potentially melt under the heat of your iron. A pin cushion or a small box will work just fine, but you will need some place to store all of those pins. You may not need 50, but it’s good to have a variety of sizes on hand. When it’s time to add elastic to a waist or leg casing, this common household item is extremely valuable. Although the bulk of the sewing that you will do is most likely going to take place at your sewing machine, there are many scenarios where you will probably need to do a little hand stitching. Sewing needles are very inexpensive so purchase a few different sizes so your covered for any need. The set in the picture even includes a nice little holder. These are the scissors you will use to cut your fabric and only your fabric. Invest in a good sharp set and as soon as they become dull either have them sharpened or invest in a new set. Do not use these scissors for anything else! You probably have a pair of these lying around the house. These are standard multi-purpose scissors. These are the scissors you will use to cut out your pattern, trim ribbon, etc. These tiny and sharp scissors are convenient for cutting away loose threads while sewing. As the name implies, they are also extremely useful while embroidering. A dull pair can be extremely annoying and cause fraying thread so make sure to get a good sharp set. Because even the best sewer messes up from time to time, this little tool will save your project. I have a small and large seam ripper on hand, but starting out, you don’t have to purchase both. If you have the option, I would go with the large seam ripper. Besides initial measurements, a tape measure can also be useful for hemming or altering clothes. 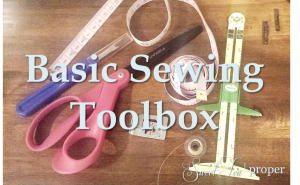 It’s a very basic tool that is included in most sewing starter sets. This tool is small, but useful. It has a sliding tab which is useful for double checking your seam allowance or measuring hems, pleats, etc. Personally, I really like the green one in the picture to the left because it’s easy to find when I’m in the middle of a project and my hectic sewing table has caused some of my tools to disappear. If you struggle with threading a needle, this device is for you. It is so simple that I couldn’t believe it the first time I tried it. You pull the thread through the much larger eye of the needle threader and somehow that fits easily into the teeny tiny eye of the needle and voila! Your needle is threaded! Any of the three will work just fine, but you will need to have something that will temporarily mark fabric. I prefer the marking pen for lighter colored fabric and chalk for darker colored fabric. Always (ALWAYS) test the fabric with the marking tool before applying it to the actual fabric piece that you are using for your project. Another item that you most likely have around your house, whether pressing the fabric or ironing the finished product, you will need to have an iron on hand for the entire sewing process. Since the majority of the things that I sew are children’s clothes, I like to use my tabletop ironing board. It doesn’t take up a lot of space and it’s easy to move around. If you plan to sew larger items such as adult clothing, curtains, or other household items, it’s probably best to have a large one handy. Whew! I know this might seem like a lot, but you probably already have a few things on hand. Once you purchase your first sewing machine, many of these must-haves are already included. For the remaining items, a sewing starter kit will include the bulk of the remaining items and then there are only a few to purchase individually.